President Donald Trump and outgoing Mexican President Enrique Pena Nieto announced they’d agreed to the outline of a new trade deal in a conference call witnessed by reporters morning. The proposed deal comes amid NAFTA negotiations. When President Donald Trump celebrated on Monday the workings of a new deal with Mexico that would replace the North American Free Trade Agreement, numerous questions were left unsettled. No full text has yet been provided. On Friday, the Trump administration plans to send Congress a formal notice of the trade agreement. Not until 30 days after that would lawmakers likely receive a text of the deal. Trump, ever focused on branding, considers the popular name for the North American Free Trade Agreement to be toxic. For Trump and other critics of NAFTA, the 1994 landmark deal might have helped companies trade more freely across national borders, but it also caused the gutting of the industrial Midwest. President Donald Trump on Tuesday jokingly asked Pittsburgh Penguins co-owner Ron Burkle if he would help re-negotiate NAFTA. 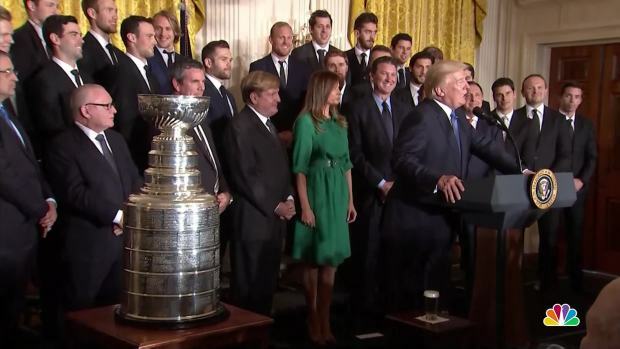 The Penguins visited the White House to celebrate their Stanley Cup title. Many economists and historians argue that the reality is more nuanced. They point out that the industrial Midwest was already struggling with closures before NAFTA was signed. They also note that while certain sectors of U.S. manufacturing were hurt by NAFTA, American consumers and companies — and workers in some industries, like agriculture — benefited from it. But Trump wants to end that debate and scrap a name he says is tainted. "I like to call this deal the United States-Mexico Trade Agreement," he said Monday. "I think it's an elegant name." Of course, there are a few problems with this particular name. Most obviously, it excludes Canada, the third member country in NAFTA. Second, it gives the United States top billing, which could be interpreted as an affront to Mexicans and Canadians. This is the wild card. The proposed deal between Mexico and the United States intensifies pressure on Canada to agree to the same terms. That said, the Trump administration had pursued the negotiations to update NAFTA with the assumption that Canada would be included. So it's unclear whether a U.S. deal with Mexico alone would clear Congress' requirements. Chrystia Freeland, Canada's minister of foreign affairs, came to Washington on Tuesday in hopes of reaching an agreement. 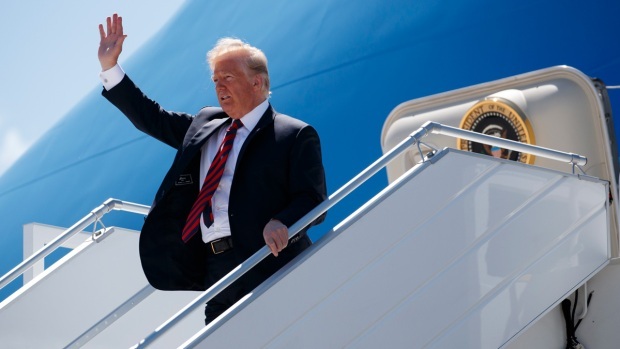 President Trump arrived for the G7 summit Friday for what are expected to be tense meetings with frustrated U.S. allies. Losing Canada would be a problem for the United States. 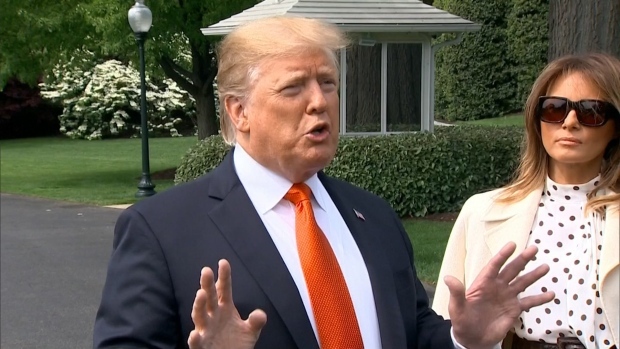 Trump on Monday seemed to suggest that trade with Canada was a "smaller segment," while Mexico is a "very large trading partner." It's not quite clear if Trump was referring to the state of the negotiating process or to the flow of imports and exports among these countries. But Canada is a dominant exporter of crude oil to the United States: It accounts for 47 percent of the barrels imported to the United States, according to the U.S. Census Bureau. Canada was the United States' second largest trading partner in 2017, ranking just below China. Mexico is the third largest U.S. trading partner. Of the $149 billion worth of auto parts imported into the United States last year, 48 percent came from Mexico and Canada, according to the U.S. International Trade Administration. The proposed deal between the United States and Mexico would likely increase that figure. It would require that 75 percent of autos contain parts made in North America, up from 62.5 percent now required by NAFTA. And 70 percent of the steel, aluminum and glass used to make a vehicle must also originate in North America. These requirements could possibly lead to fewer imports from Asia, Europe and South America. A major wage gap separates autoworkers in the United States and Mexico, and this new provision aims to narrow it. An average Mexican autoworker earned $5.21 an hour, and auto parts workers make even less than that, according to a 2016 analysis by the Center for Automotive Research. That is about one-fourth the average hourly earnings of $21.68 for a U.S. autoworker, according to the Bureau of Labor Statistics. Trump can say that the wage requirement will preserve factory jobs in the United States, while the Mexican government can say it will boost incomes in that country. "There is no doubt this agreement creates incentives for the salaries in the auto industry grow over time," Foreign Minister Luis Videgaray Caso of Mexico told The Associated Press. "A percentage of the value of the vehicle must be made in areas with high salaries. This generates a clear incentive for the salaries in Mexico eventually reach a higher level." The agreement would force countries to update the trade pact. One of the criticisms of the 24 year-old North American Free Trade Agreement was that it no longer applies to the economy as it exists today. It was forged before the internet, smartphones, social media or China's entrance into the World Trade Organization — transformations that leave parts of NAFTA woefully outdated. This new clause could create two forms of pressure: Countries would feel obligated to update the agreement in order to preserve it. But businesses could also face tremendous uncertainty if the agreement was on the verge of ending. 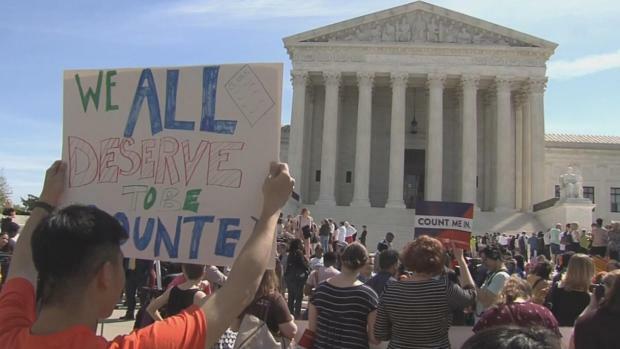 AP writer Luis Alonso Lugo contributed to this report.